Are you a gamer who enjoys a break from video games from time-to-time? Do you like playing board, dice and card games? Then this club is perfect for you! We meet every two weeks for 90-minute gaming sessions in T211. Attendees are welcome to bring their own games or select from our collection. Sessions typically focus on different groups who explore their own passion. 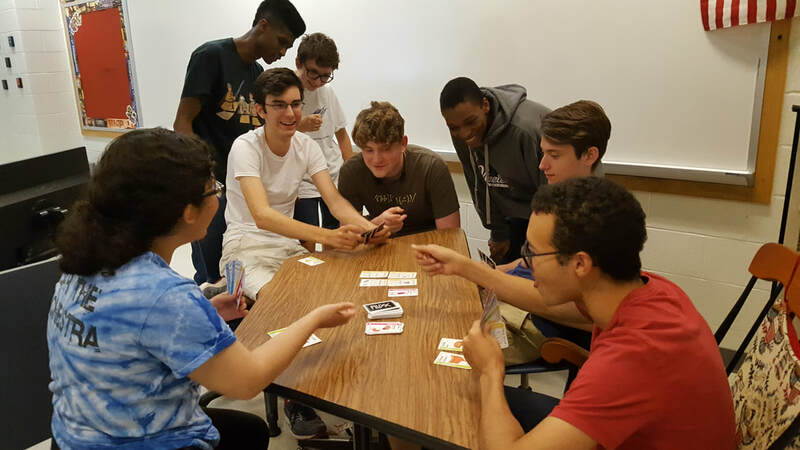 Recent games played include: Dungeons & Dragons, Magic the Gathering, and Yu-Gi-Oh! Our club is open to all students in grades 8-12. Students are expected to follow all school rules while participating in student clubs. Because we meet after school hours, phones are permitted as this makes parental contact easier as needed and to make sure students have an arranged ride before the end of meetings. We understand that students often get caught up in the moment, especially when playing games. But, all students are expected to use appropriate language while participating in club events. Since this club involves both middle and high school students on school property, use of inappropriate language will not be tolerated. First infraction, the student will be warned. Second infraction, the student's parent will be contacted. Third infraction, the student will be asked to leave the club. After the meeting ends, students are expected to be picked up in the car riding area out front of the school. Parents should plan on their student being released from club at the times indicated below and students are expected to have transportation arrangements made prior to attending any club event.